Apple has always had a focus on mobile gaming, and has been cultivating a pretty solid games ecosystem on its mobile platform. For better or worse, many of the best mobile games are either iOS only or at least hit iOS before Android or Windows Phone (not counting Microsoft's Xbox exclusives of course.) And, it looks like iOS 7 is going to make a push to bring even better gaming with standardized controller support. You probably didn't notice it during Apple's Worldwide Developers Conference keynote, but the company has added support for MFi game controllers to its SDK. This means that rather than forcing developers to design only for the touchscreen, and hope it will work with whatever game controller add-on someone may have bought, devs can now code hardware controller support and expect it to work (assuming the controllers follow Apple's standards). 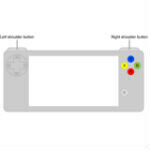 The standards haven't been finalized yet, but Touch Arcade has posted the image to the right, which shows two options being considered for the standard iOS game controller configuration. One looks like a simple iPhone case that would add a D-pad, four thumb buttons, and two shoulder buttons; and, the other has the body of a SEGA Genesis controller with the button configuration of a dual-stick SNES controller. This could easily lead to a boom for accessory makers, and of course it also leads to questions about whether or not your iOS device may soon become a game controller for your Apple TV. Poor Apple, trying to make a deal with Nintendo? Greetzz. Why not? They make deal with HTC! Next can be Google!!!!! I do think this is a good idea. 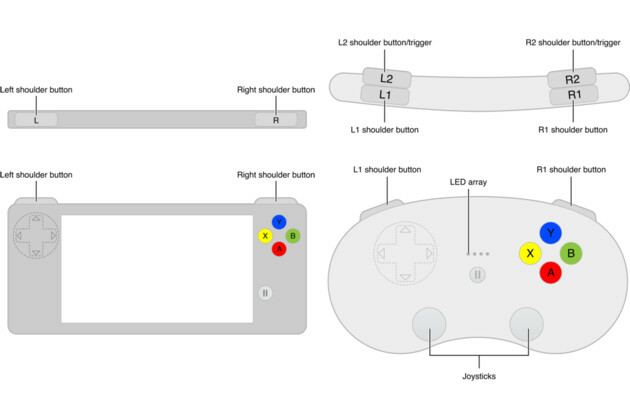 Wish Google include controller support in their standard API and also a standard controller layout just pay Nintendo for a license. Just one day Nintendo might even build their console in the Android platform as it is a open platform and Nintendo can have full control and ownership like Amazon.com kindle platform. And again they are taking Nintendo's idea. Tech, you'd have better luck trying to explain something to a corn chip, than trying to explain it to gadget. He has one gear, anti apple. If Tim Cook pumps gas, as far as gadgets concerned he copied android. I knew someone would make this silly argument. 1) Nintendo didn't invent the game controller. 2) This is standard practice if you're serious about gaming. It's not like Nintendo, Microsoft, and Sony allow 3rd party manufacturers to make controllers with any button configuration they want. well ok MichaelHeller bout the transparent on screen display that Apple took from LG? What about the screen name you stole from the 80's cartoon? If you actually bothered to look past the first step, you'd see that anything you're talking about goes much farther back. LG wasn't the first to use transparent on screen display, because that's called a piece of glass. Go to your window with a marker and you've got a transparent display. Who are you? I mean from what planet? This is a great move by Apple. I hope Google does something similar. having a default control so all developers could just follow one control scheme rather than the hundreds that are already on the market. The first one (square one) looks alot like the Wii U GamePad, the second one looks alot like the classic controller, which if im not mistaken, are both patented by Nintendo. I see lawsuits from Nintendo a possibility. +1 but i prefer X and Y ! Greetzz. I gotta commend Apple for their efforts. they're trying to give users no reason to put down their iPhones for any reason. IOS 7 looks horrible with the new icons and flatter looks, but the functionality is actually a little better. The transitions and animations look really nice, Air Drop isn't all that bad, and the other added features will keep SOME iOS fans in an iOS device. Still won't be getting one, but it does seem to be okay for their target audience. Sony made a damn good showing with the PSP. Not so much with the Vita though. Yay! hooking controllers to your smartphone! welcome to 2009! Pushing native arcade-style gamepads is good, but wait... didn't Sony, Moga and others already do this? Guess it takes Apple to get developers interested, which is sad to say the least. Didn't Nokia do this already??? I would actually consider a game pad like the orginal Xperia phone as a game system if it's reasonably priced.. which considering it's apple it won't be.